I'm still a massive fan of DOW2 (I loved DOW1 too) but I feel the DOW2 community is split between Retribution and Elite Mod. I really honestly think Relic would be onto a very easy win if they released some content for DOW2. I think they could give a nod to the first Dark Crusade by creating an "expansion" similar in theme to the DOW1 Dark Crusade. All it needs is to include Necron and Tau races, iron out some bugs and add a few more maps and a new Last Stand map. Maybe adopt a lot of the balancing that has taken place in Elite Mod (with their cooperation of course). The reason I think it only should be more of a race pack and balance/bug smasher and maps because I don't think Relic would have the time nor resources to make a campaign nor would they now that DOW3 is out. I would genuinely pay £10, £15? for that and I think a lot of others would too. I also think it would bring a lot of those DOW players back as well as maybe unifying the DOW2 community again. People seem to think that a series of balance patches (whether they're successful or not) will be enough to instill confidence in the game back into the community that has all but abandoned it. I disagree entirely. I think this was such a botched release that reframing the game under a different name using an expansion would be the only way to signal to the community "we think we've really made significant enough changes to get this game back on track." I think theres no way that the people who left the game will pay full ticket price for the expansion and so very steep discounts would be required. And even if those discounts amounted to a net loss on the project as a whole, they would be retaining the value of the DoW brand which is infinitely more important that the profit on any single release. For me personally I'm not really interested in DOW3 but of course I understand that they have to patch it for the DOW3 players. I just know that there is a huge discord between most previous DOW players and the current DOW3 players. I think the DOW2 "loyalists" would honestly be happy with my suggestion above. I really believe that just that alone would draw thousands of players back to play it again. You're right though, I don't think they can charge full price for it but then I'm not really even asking for a full game, just an expansion. Relic would make good money from it without having to worry about creating MASSES of content from scratch. As much as I'd like it if this happenend too, it probably doesn't make sense to Relic. They'd likely make more money by instead spending those development hours on just adding new stuff to DoW3 instead, despite the negative feedback it has got from some fans. DoW2's multiplayer was just never that popular, people loved the (co-op) campaigns and The Last Stand, but the DoW multiplayer fan-base has always seemed much more interested in DoW1's core multiplayer than DoW2's. As it doesn't make sense to develop for that either, DoW3 is closer to DoW1 than DoW2 is in it's gameplay. I also remember reading an article when the Necron Lord was released for Last Stand that was an interview with Relic, and they said something about how difficult it was going back to the production tools for DoW2 and how aged and inefficient they seemed to them now, so chances are they wouldn't have much interest in working with them again to establish some brand new complete races too, either. thats an average player score of 4.8 which was actually the exact same metacritic user score No Man's Sky had around release. No body can claim this game was well received by anybody except the critics who didn't play it long enough to identify is deep rooted flaws and just wanted to write their article to get their paycheck. Agreed mate, the thing is it's not even like Relic wasn't forewarned about the potential for a negative reception. Nearly all of their videos pre-released were getting masses of thumbs down and negative comments. It seems very obvious to me that the target audience was never really the core Dawn of War fans but rather they were bidding for Starcraft fans, hence choosing to promote the game with InControl from the SC2 community rather than it's own prominent figures in the Dawn of War community, to me that is very indicative of their strategy - they wanted a cash cow from this game. I think a lot of DOW fans loved DOW because it WASN'T like the cartoony, childish Blizzard games. Back to my point regarding a DOW2 expansion, I think it would appease some of the old DOW2 fans if they released a couple of new races for DOW2 and brought in a patch - this would hopefully unify the split between Elite Mod and Retribution player bases and might reignite the game a bit. Perhaps to appease some of the DOW1 fans maybe some new maps could be released or something? DoW 2 is pretty much dying and already got what? 2-3 expansions! No thanks. DoW 2 was a fun game but just failed in so many other things thats why its dead and got a elite mod that actually started out as a balance mod because DoW 2 was a cheeze fest thanks to a few things. DOW2 looks great graphically would love a whole new set of campaigns with that squad based model. Shame you feel that way, I think it's a superb game.... still my go-to RTS even now. I get what you're saying that there isn't much of a player base but I honestly think... if a "Dark Crusade" was created for DOW2 to the same calibre that Dark Crusade was for DOW1 then I think you'd get a LOT of players returning. The campaign would be alot of fun for sure. But it would just make old fans return. The market for RTS games is very small and Relic is trying to push things forward. Who knows maybe the next expansion will feature a meta map campaign with special missions and more cool stuff. That is is gonna make old fans return too. Why fiddle with old games when DoW 3 is like a fresh slate with alot of improvements that the other DoWs didnt have With support relic can do alot. And relic has been trying to give fans what they want. So who knows what big things they have planned. Realistically any game that is good will sell to gamers regardless of genre. DOW3 went for a niche audience being the starcraft audience within the niche audience of RTS games, the game offers nothing to any other audience due to its target being so small. DOW3 if their not appealing to DOW fans like you said doesnt even need the GW license to appeal to GW fans, they should just get rid of it if thats the case and make their own game if your saying they should have no desire to sell DOW games to DOW fans of the original games, maybe that is why DOW3 isnt doing better sales wise? They didnt just apply to star craft players thats just silly. They tried to make everyone happy but also get new blood. Cant do that if you go with the old. Consumers rarely buy or engage in something simply because it shares it the same name even if their fans of a product based on the name such as could be seen with movie reboots like Ghostbusters where the new story replaces the history of an already existing universe. Imagine if star wars just got rid of the past in the same way saying the new ones are better because their newer, that would probably not end well. Well Star wars actually retconned half of their universe LOL. AND ARE GETTING AWAY WITH IT HEHE. 1-Give DoW2 vehicles reverse move option. 2-Increase the number of tsm type squads to 4+1leader(current 3+1 is ridiculous), same goes for devastators and assault type squads. 3-Remove base turrets but add an immune to suppression aura. 4-Give certain abilities to certain units missing them fitting their nature like CSM predator tank can charge and heavily damage infantry with its frontal spikes. 5-Revisit squad size in general fitting each faction's nature. 6-Give true sight (it's ridiculous to see behind cliffs). 7-Increase size of 123vs maps (it's laughable to walk 1 meter and meet the enemy). 8-No idea if this one will happen but it would be much better to have certain points around the map like the campaign production points which by capping them gives the option to produce units from this point so we get multiple production at once and gives map control more value also improves balance. DoW 2 would still end up being a turd when it comes to PVP even more so with an expansion. 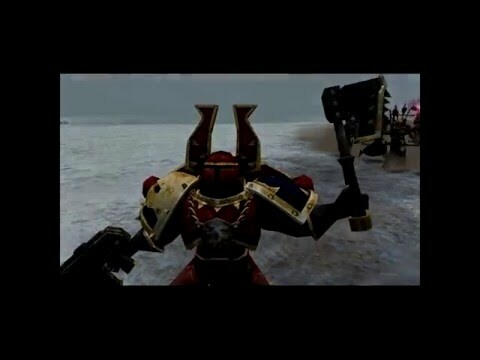 That was the best review for DC I have ever seen.I watched rest of his Dawn of War videos and that guy knoes how to review.He rekt Soulstorm 5/10,unnesessary sequel definitely. LuLz. The balance set back would be more noticable with DoW 3. But it would not be that bad cause more races means more players and input. Since DoW 2 balance is fucked already nobody cares about it at this point. If relic gave a ++heresy redacted++ about 3 then they would of had 4 races, except you got 3 vanila races. You aint getting another, and even if you do, congratulations, everyone assumed there was going to be 4 races on release (lol even speculation from screen shots seeing guardsmen and necron pilars) so it scrapes through as the bare minimum of what people were expecting. If relic only added 3 races at launch says nothing if relic gives a ++heresy redacted++ or not. Why should i make an elite mod? Also people assume alot of things thats what hype does. Relic never stated they were going to launch with 4 races so what does it matter? Why does it matter? Its the whole reason DOW 3 failed, it let everyone down on all aspects of the game, from 3 vanilla race when precious titles had 4 to the lack luster graphics and animations. Elite mod is sitting balanced atm, Caeltos adding Grey Knights was broken for a bit but after time everything got polished up to where its competitive. If they ever get around to releasing a new faction in 3 do you think it will be balanced? They cant even get it right now (which was the case for Retribution, Ig heavy weapons squad was broken for years) and if they do you bet your arse they will make you pay for it which is the way all games are going now. Seriously doubt elite mod is balanced. Better yeah sure but not balanced. Graphics aint lack luster at all but that is a matter of oppinion really. Animations i can partially agree with but you cant really compare it to DoW 2 since there is alot less going on in that game and the smaller scale allows them to focus more on the individual units. The balance in DoW 3 is much better compared to the other games. The only issue atm is the meta , reinforcements, fobs and economy that has been changed countless times. These are things that will most likely be addressed in the next patch though. The stuff in DoW 3 aint nothing compared to what happenend in DoW 2 imo. Also. Relic has been far more active at dealing with these problems compared to the previous titles. I am one of those folks that never got into DOW3. It's a shame it's come to this but I can see why it did. Come on Relic, pull yourself up by the bootstraps now, you can so do this idea now!!! I swear to god this would bring a lot of players back to retail DOW2 if you got those balance and bugs issues ironed out.